How to paint a rose, flemish style. 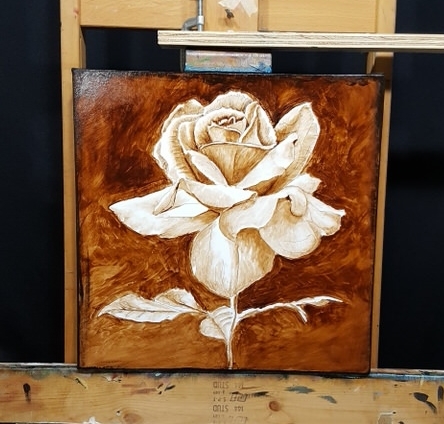 How to paint a rose using the flemish technique. 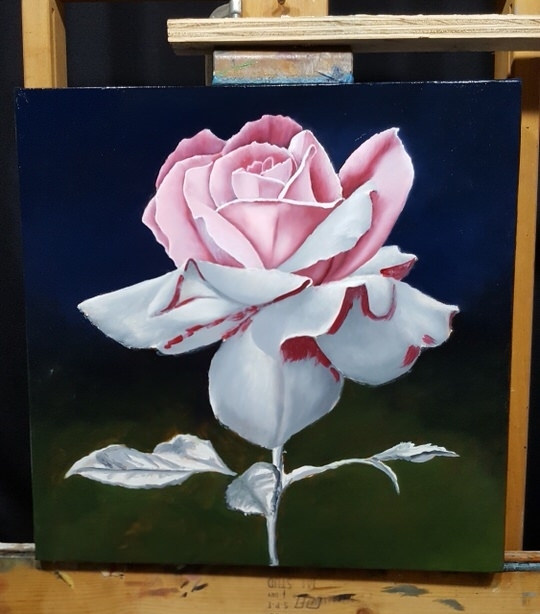 This demonstration will show you the basic steps in achieving a level of realism that is difficult to achieve any other way. Why make such a statement? Well, I get asked this question a lot, why not just paint directly? My answer is usually the same. 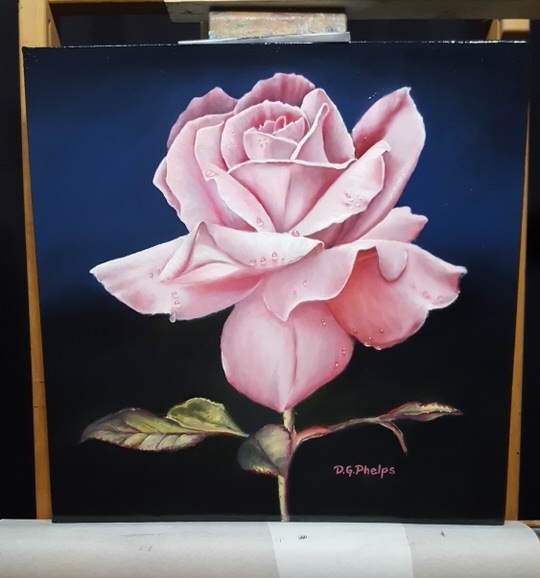 Unless you understand the properties of oil paint, very very few artists can achieve this level of realism using a direct method of painting. Some subject matter can be reproduced using other methods and in my view, pass the realism test. 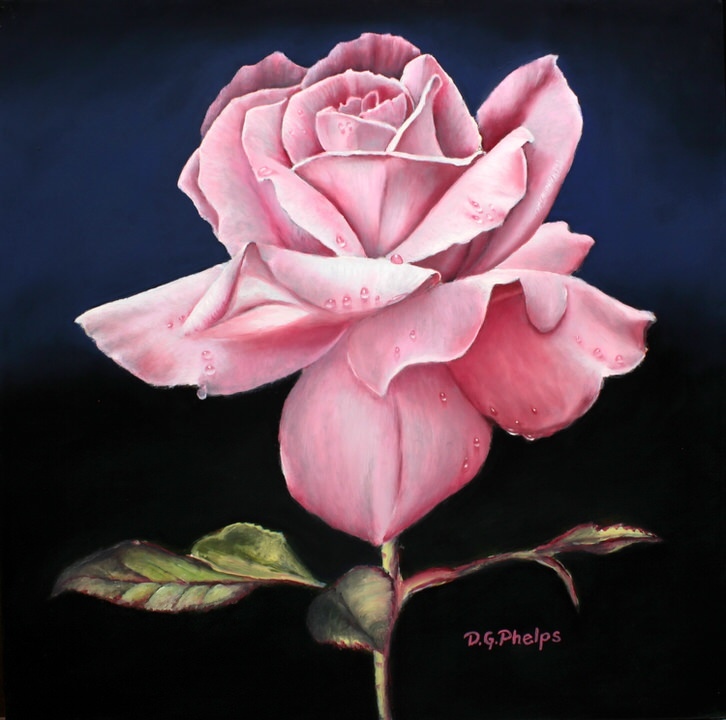 I feature some of those paintings here on the site, and how they were created. But my fall back is usually this indirect, flemish method. 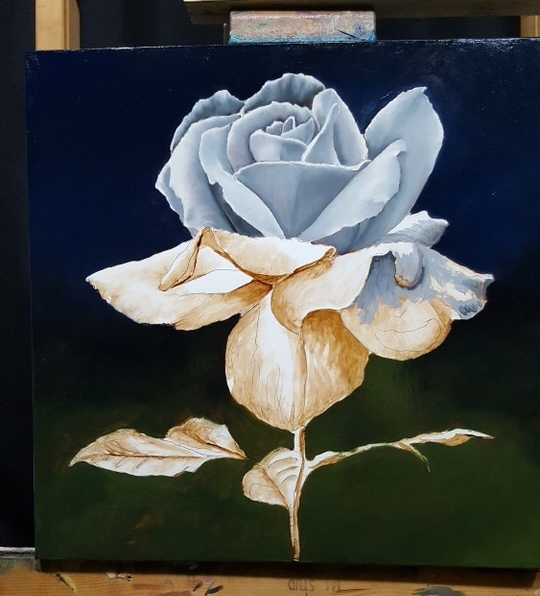 In a nut shell, it consists of a brown underpainting, a gray underpainting on top of that, color layers and finally a finishing layer in which the texture of the objects are created. A minimum of 4 layers. So, lets get started! Here's a short film that discusses what we have in store below, but only scratching the surface. More details are within the article. There is also a great segment at about 3 minutes in that shows the actual 3 brush blending technique I employ in this style of painting. 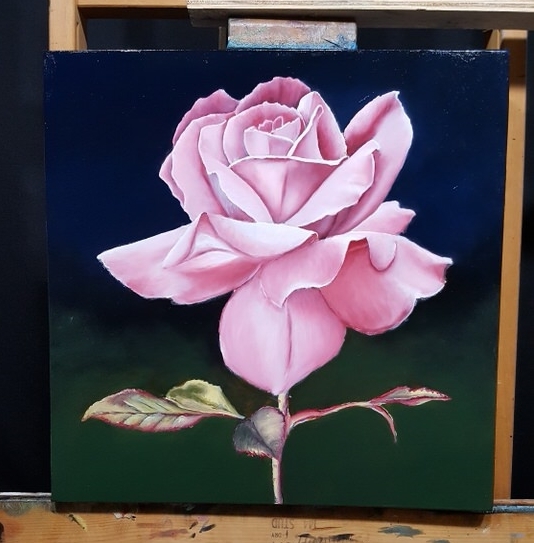 How to paint a rose, flemish technique. Click on any image to enlarge. Quite a bit a detail is available. Here is a link to a page on how to make these. 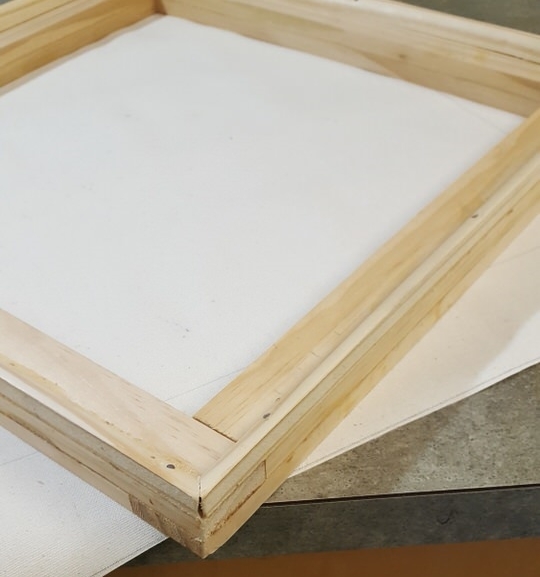 Because my customer wanted a rather thick 1.5" depth gallery wrapped canvas, I doubled up on the lumber for the frame. You can see the overlapping pieces in the above picture. Remember to keep the weave of the canvas in line with the edge of the stretcher bar. 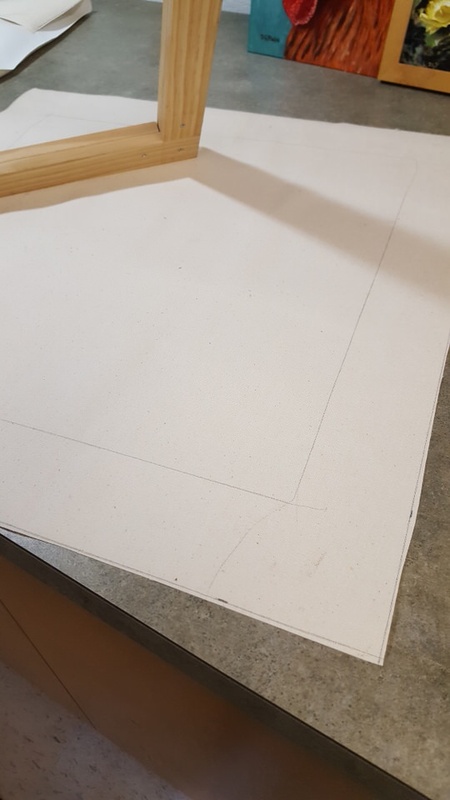 I leave enough canvas to wrap around the side of the canvas and enough to use my canvas pliers in stretching. 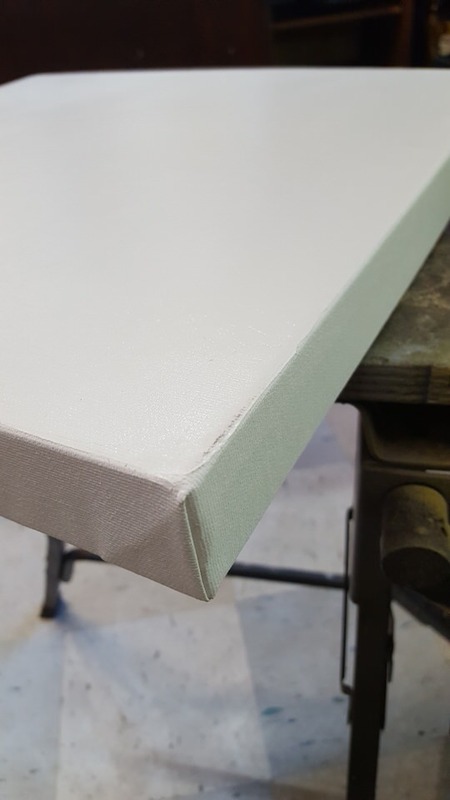 Perfectly folded canvas corners for gallery wrapped canvas. My drill sergeant would be so proud to see these perfect hospital corners, and yes, I can bounce a quarter off that canvas 3 feet high! Follow the link above on how to make these too, they are discussed in the same article. 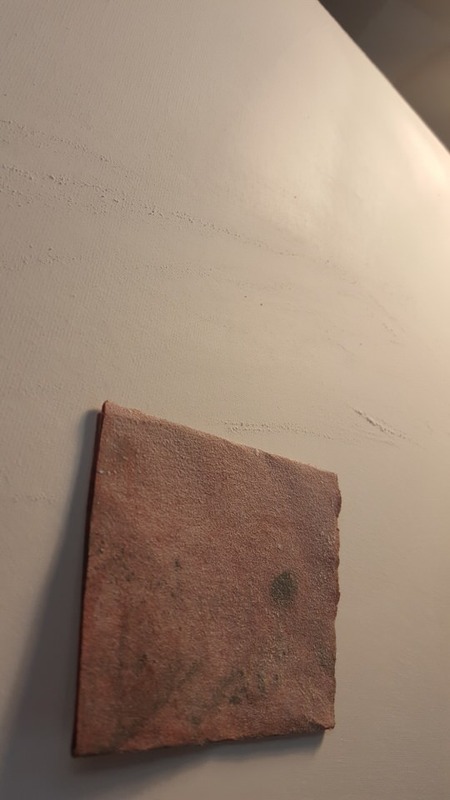 As discussed in my eBook, you can use a single edged razor for large imperfections, but 400 grit sandpaper works just as well. Remember to wear breathing protection anytime you are dry sanding! Dust masks are readily available at lumber stores, DIY stores and even Walmart! 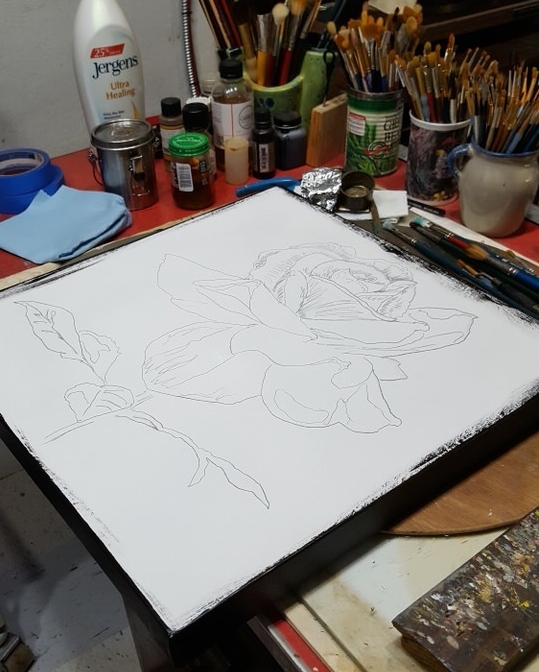 In the above photo, you can see a primitive sketch (mostly an outline) and the sides of the canvas already painted (using a semi-gloss acrylic paint) You can get more detailed with your drawing as it helps in each stage of the painting process. 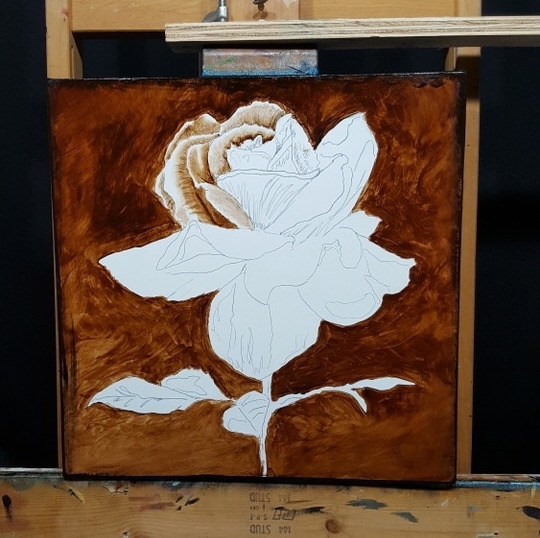 Now my brown umber underpainting is started. It is put in loosely with broad strokes and the mixture is pretty thin with only turps or OMS as a medium. It is handled like a watercolor. 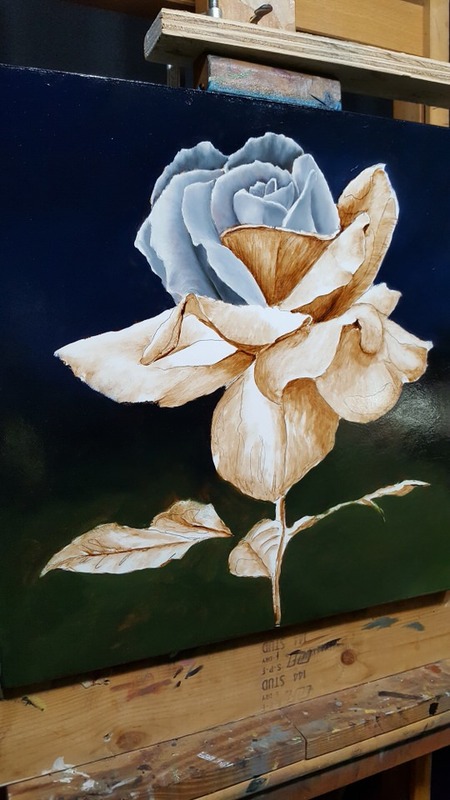 Above, the rose umber underpainting is completed. At each stage of this process, ask yourself, "can I hang this as a completed painting even at this stage?" If you answer yes, then you can move to the next stage, or, say it's done, sign it, and sell it! Here you can see I have started the gray underpainting. I work from top to bottom and left to right because I'm predominantly right handed. The most important layer in my opinion as it establishes most of the modeling, half tones and gives the viewer the understanding of what is being depicted. If you finish this layer well, you will end up with a great painting! 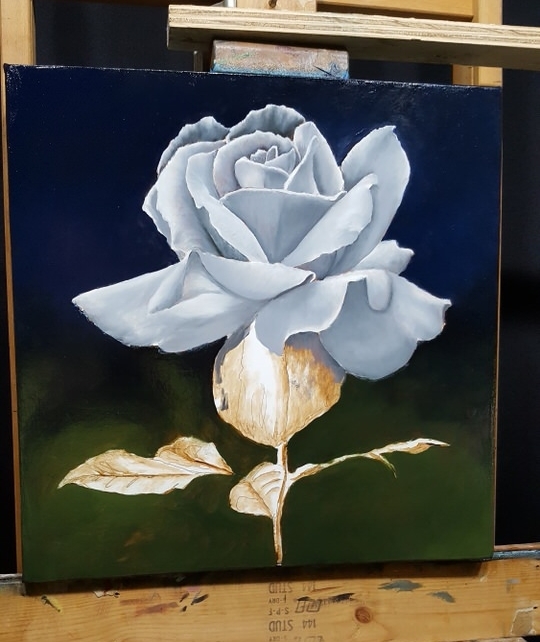 How to paint a rose, the gray layer completed. Again, I ask myself, would I consider this a completed painting at this stage. I think yes. 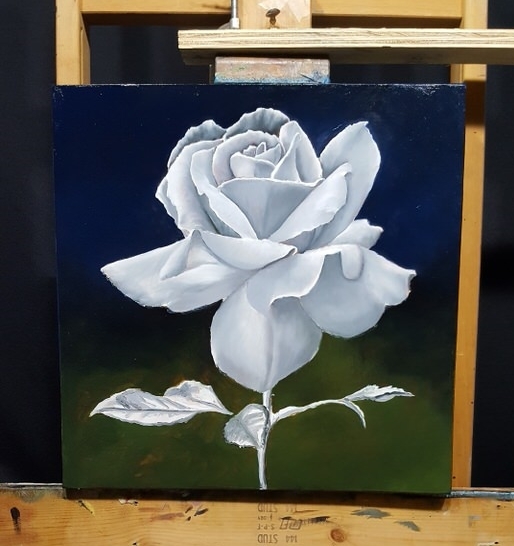 It looks like a very cold rose with it's blue and green background. 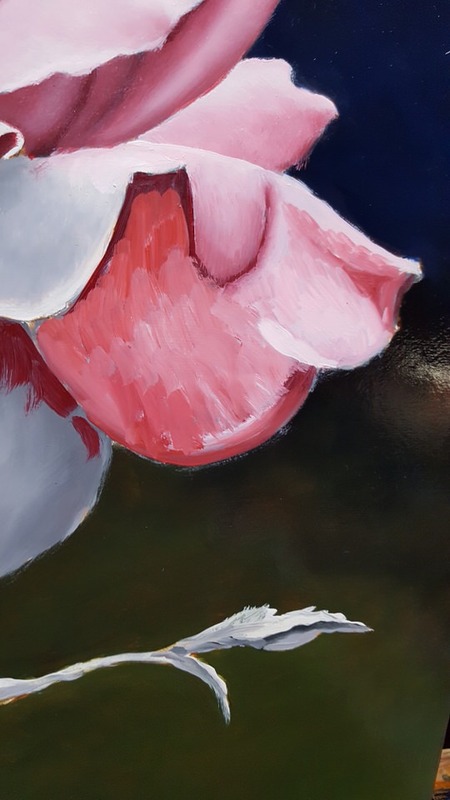 Watch the video above, at about 3 minutes in, I show the laying in of color and subsequent blending that follows on this particular part of the painting. At this stage, I'm almost done. My client wished to have the pinks toned down and muted. I have to say, I believe my client has an inner artist. Her requests have always made for a better painting! By adding gray glazes to portions of the painting, and strengthening some of the details, I am happy with my results. Are you wanting more information, details, and a better understanding of the technique? Click here and get the eBook. Better yet, I've got a great deal on the eBook and DVD combination! Check it out.